Pros: Stirring a capella singing weaves with text to tell a vital story. 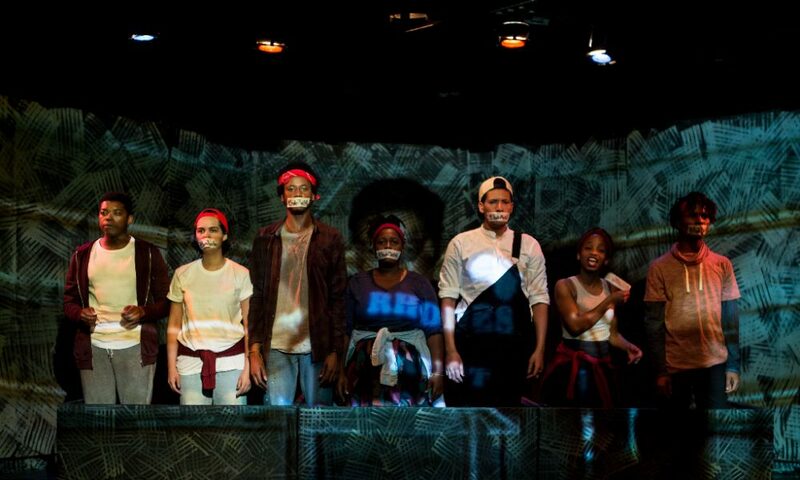 A faultless ensemble brings the recent events surrounding the student movement in Cape Town vividly to life. Minimal set, maximal talents and sharp dialogue make for a captivating experience. It is twenty three years since the end of Apartheid in South Africa and the legacy of white-minority rule and institutionalised racism remains keenly felt. 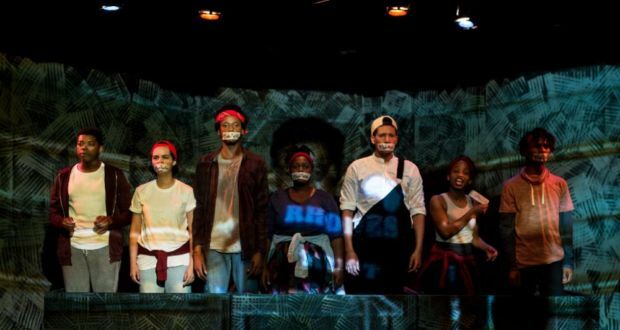 Devised and co-written by the performers – many of whom studied at the University of Cape Town (UCT) – The Fall centres around the student-led movement of 2015 which led to the statue of colonialist Cecil Rhodes being removed from the UCT Campus. From the moment seven actors of colour marched into the Jerwood Theatre Upstairs at the Royal Court, moving in unison and singing in harmony, the hairs on my arms were standing on end. The story drops straight into the action, as black students occupy a university building and hold earnest discussions about the oppression and discrimination they experience. Their rationale for removing Rhodes is neatly outlined in a monologue from Kgothatso (Oarabile Ditsele) climaxing with the line ‘They say he donated the land, but whose land was it to begin with?’. The piece succeeds in capturing a momentous period which did not simply start and finish with toppling the statue – rather it was a time when young people of colour began to find their voices. A minimal set (three tables) is used to create a variety of situations – they are stood on, carried, drummed on – the ensemble always in confident command of the space. As they recount the moment the statue fell the ensemble shift into slow motion, with different actors stepping out to reflect on what the moment meant to them. 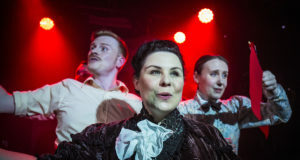 An authentic cross-section of voices are represented and much skill is in evidence from the performers who succeed in realising distinctive characters while also functioning as a tight ensemble. Singing together they make a full and uplifting sound, which sometimes overlays and sometimes underpins dialogue, creating texture and heightening emotion. A charged discussion about gender, sexuality and race follows the fall of the statue and Camilla (Ameera Conrad) erupts with rage when Zukile-Libalele (Sihle Mnqwazana) dismisses her experience because she is female and has ‘white blood’. In a tour de force she roars in fury about the terrible reality of ‘corrective rapes’ for gay women. When she slams her fist on the table and storms out, it is obvious that these issues matter deeply to the characters and the cast. Rhodes Must Fall is followed by Fees Must Fall, and Camilla rejoins the movement. 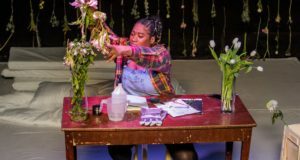 The economic hardship that black students face is addressed through a series of pacey, well-written monologues and fresh dialogue, the tone of which is never sermonising. Demanding free education, the students storm the parliament building. Scenes from the violent real life protest are projected onto the back wall – a stark reminder that this is a true story. A shocking illustration of institutionalised racism comes when students describe how the white students willingly formed a human shield around the black students as the police were reluctant to use force against the whites. The students don’t get the result they want and continue to grapple with how to effect change. The heavy subject matter is undercut from time to time with nicely timed comic moments which remind the audience how youthful the movement was – pizzas and drinks at the Pig and Swizzle sit alongside talk of stun grenades, burns and tear gas. The difficulty with this story is that it is still unfolding, which meant that the ending of the piece feels like a perfunctory wrapping up of something which by its nature lacks a satisfying conclusion. However, the first-rate cast and script smooth this over. A wearied Qhawekazi (Tankiso Mamabolo) delivers the final monologue addressing South Africa’s uncertain future. Her real tears are a testament to the tangible pain of colonialism’s legacy and a reminder that theatre can be a force for change. Written and Performed by: Ameera Conrad, Oarabile Ditsele, Tankiso Mamabolo, Sihle Mnqwazana, Sizwesandile Mnisi and Cleo Raatus.